Thanks to our friends at Huffington Post, for originally posting this. 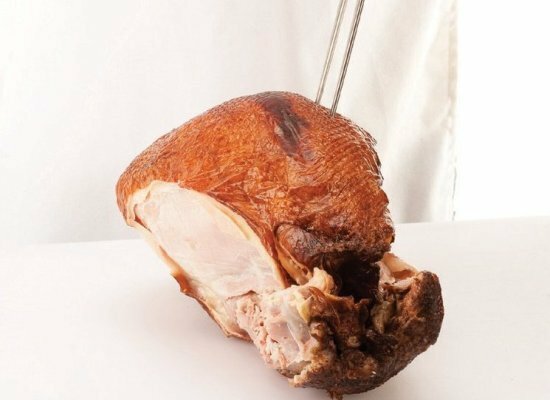 Place the turkey on the cutting board or a platter, breast side up, with the legs facing away from you. 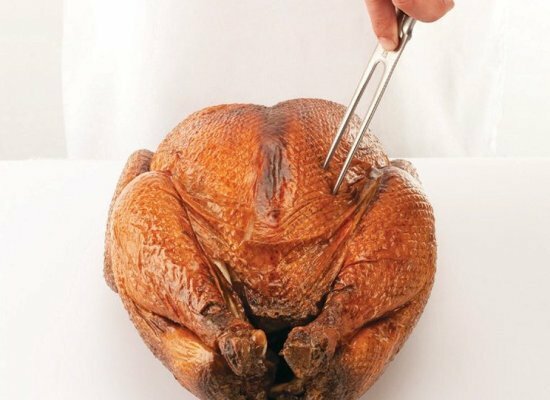 Steady it with the carving fork in your guide hand. 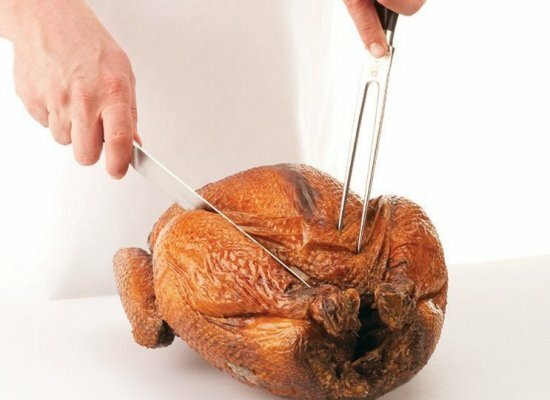 Cut through the skin that connects one leg to the carcass, cutting as close to the leg as possible. 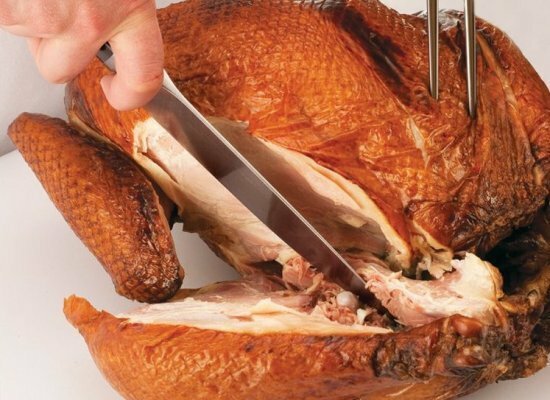 Cut straight through the joint with the knife. The leg will now pull easily away from the carcass. 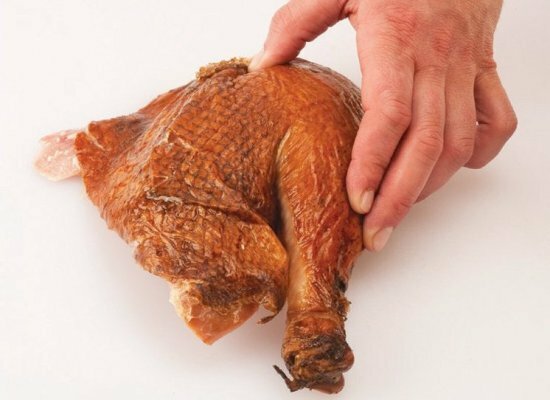 Lay the leg on the board, with the knee facing you, and feel for the joint connecting the drumstick bone and the thigh bone. Repeat previous steps with the other leg. 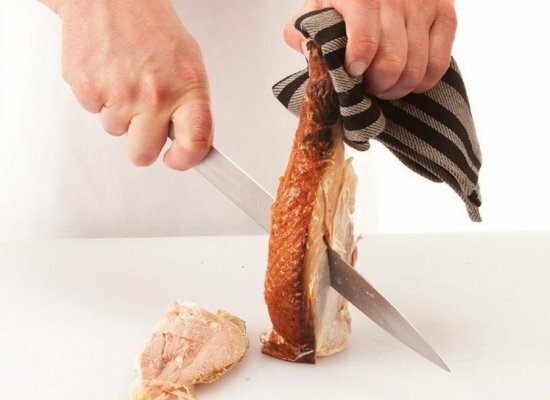 With your guide hand, hold a drumstick vertically by the end of the bone (the ankle) and let it rest on the cutting board. Cut straight down along the bone, removing the meat in one piece. 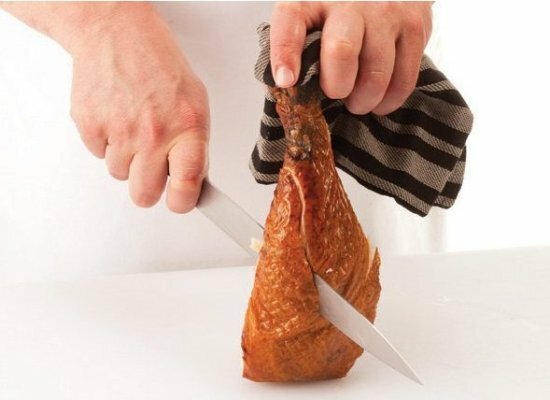 Rotate the drumstick and continue cutting straight down along the bone until all the meat is removed from the bone. 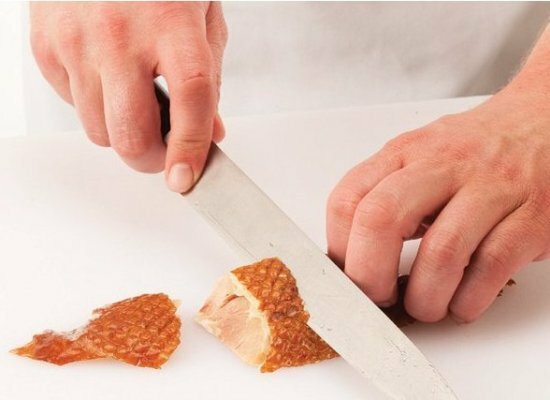 Bias-cut the drumstick meat into serving-size pieces. Repeat previous steps with the other drumstick. 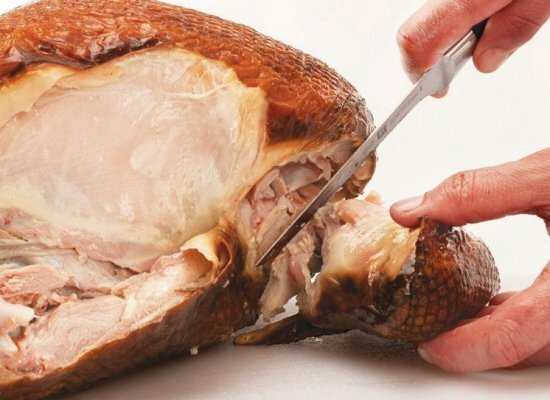 Lay a thigh on the cutting board, skin side down, and steady it with the carving fork in your guide hand. Cut along both sides of the bone, from one end to the other. Hold the knife blade parallel to the board and slip it underneath the bone. Cut along the length of the bone to free it from the meat. Pull the bone away from the meat. 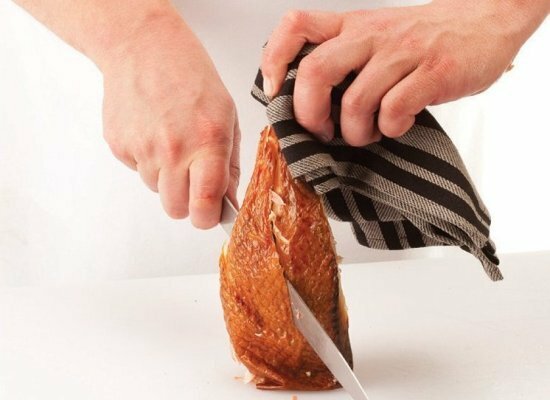 Flip the thigh so that it’s skin side up and bias-cut it into serving-size slices. Repeat previous steps with the other thigh. 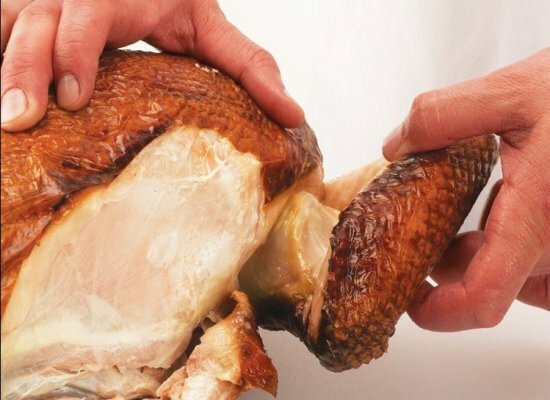 Grip a wing with your guide hand and pull it gently away from the carcass so you can see where it is attached. Work the tip of the knife between the ball joint of the wing and the socket. 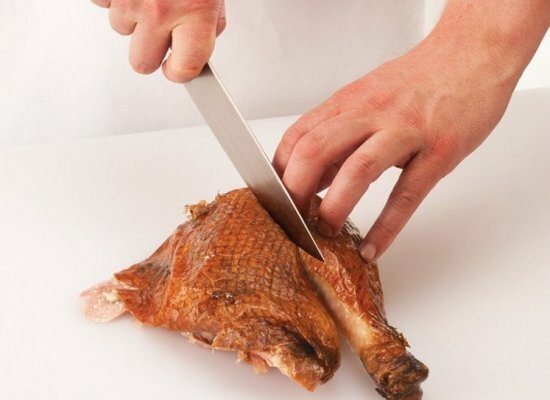 Cut all the way through the joint, through any meat and skin, and remove the wing from the carcass. 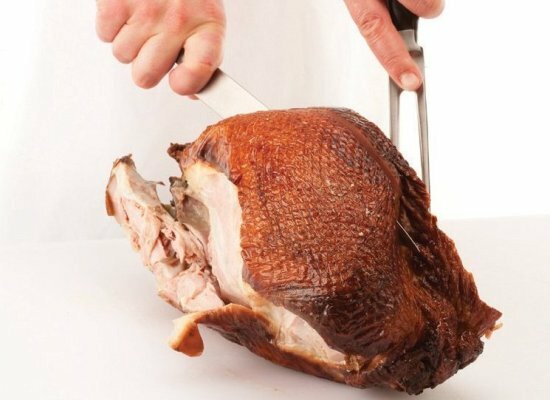 Rotate the turkey so that the other wing is facing your guide hand. Repeat previous steps to remove it. 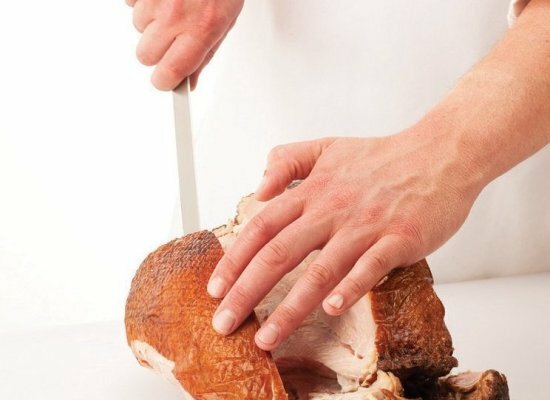 Steady the side of the breast you’re not carving with the carving fork in your guide hand. 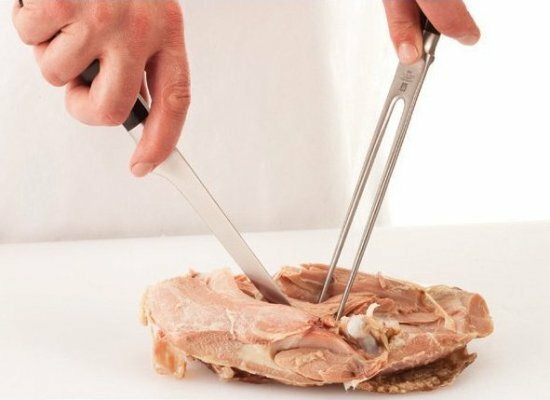 Make a long, thin cut along the breastbone, in the center of the breast. 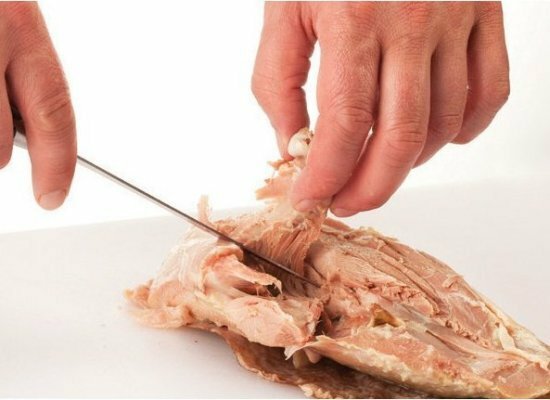 Using the tip of the knife, cut down along one side of the rib cage, then lay down the carving fork and use your guide hand to push or pull the breast gently away from the ribs as you go. Let the knife blade ride the rib cage straight down to the socket where the wing was attached. 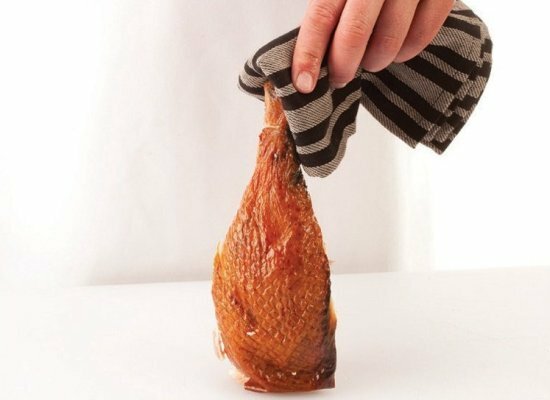 Cut along the bottom of the breast to remove that half completely. 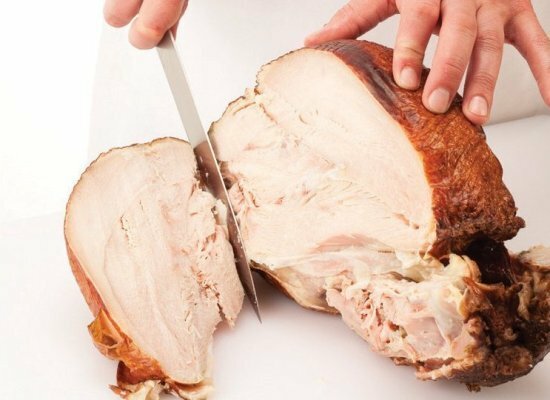 Lay the breast half on the cutting board, skin side up, and bias-cut it into serving-size slices. 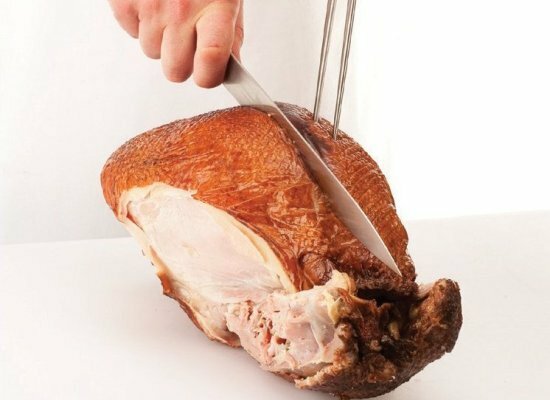 Steady the carcass with the carving fork and repeat previous steps with the other side of the breast. Who remembers the old A&W drive-up restaurants?